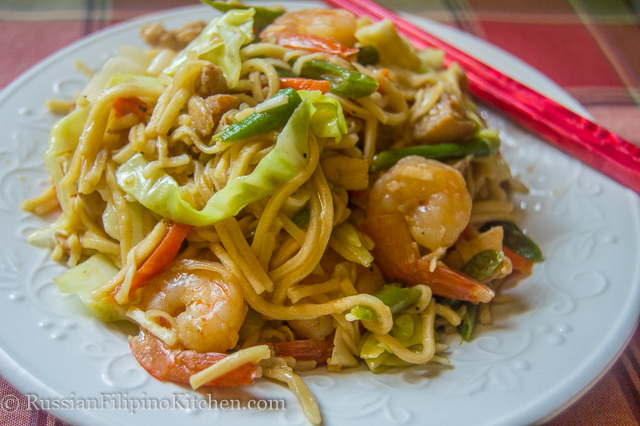 The Philippines has many variations of pancit dishes depending on the region where it originated. 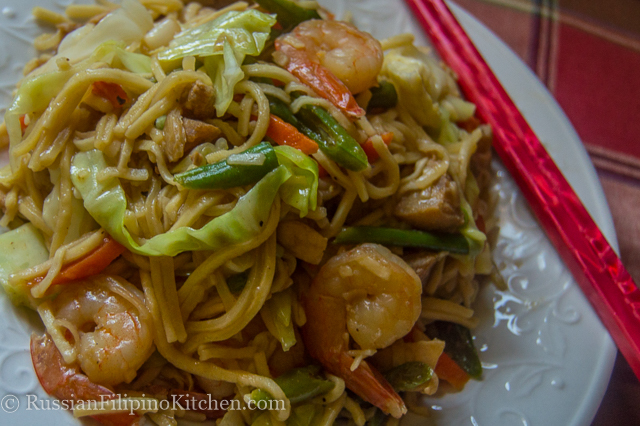 Pancit or pansit (pronounced PAHN-SIT) is a well-known Filipino food strongly influenced by Chinese cooking. It’s a noodle dish made from rice flour or wheat flavored with meat, vegetables, soy sauce, and some spices. Just like the Chinese, Filipinos believe that eating pancit during birthdays makes the person live longer, therefore there’s always pancit during this special occasion. However, through time this delectable dish has become a regular menu on Filipino tables, making it one of the most cooked and popular dishes in Philippine cuisine. 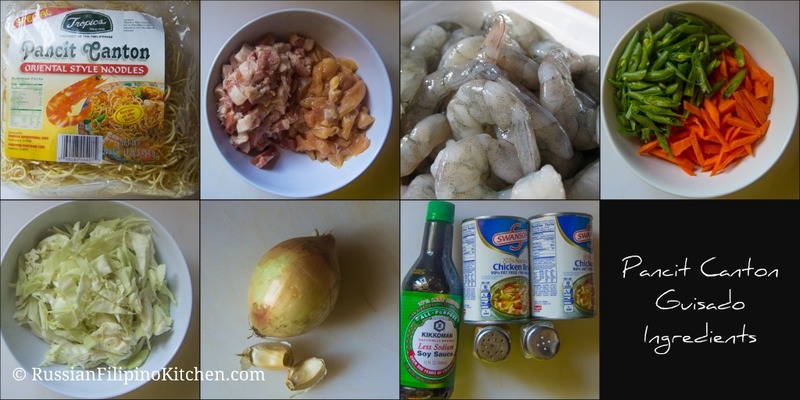 For this post, I’d like to share how I make pancit canton guisado with pork, chicken, and shrimps. 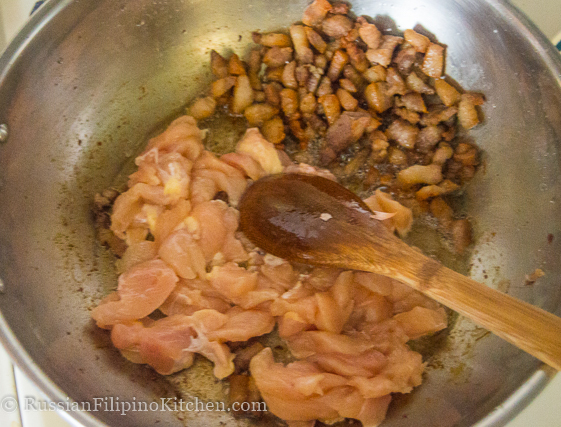 “Guisado” in Filipino term simply means sautéed. You will love this easy recipe for its simplicity and a wonderful combination of flavor that will surely tickle your palate. 1. Heat wok or large skillet. Salt pork belly with 1/8 tsp salt and let it brown. Let fat dissolve and come out. This step takes about 8-10 minutes . Discard oil leaving only 2 tbsp for sauteing. 2. Throw in chicken breast and sauté until no longer pink, about 2 minutes. 3. Add shrimps and cook until they turn orange, about 1 minute. 4. Add garlic and onions and sauté until onions are translucent, about 3 minutes. 5. Add carrots and green beans. Sauté for a minute then add the soy sauce and ground black pepper. Cook for 2 minutes till halfway done. Do not overcook. 6. 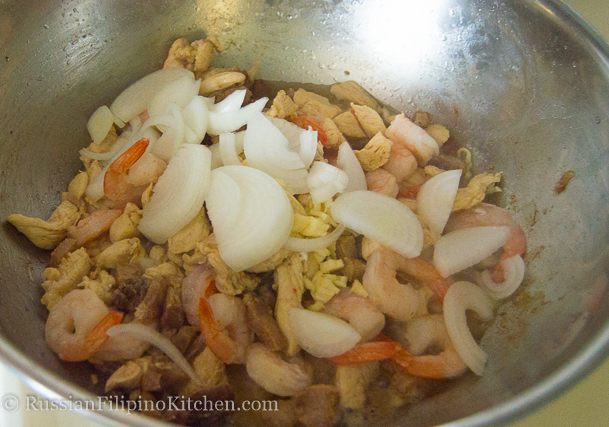 Transfer pancit base to a heat-proof container and set aside. 7. In the same skillet where you sauté the meat and vegetables, pour 4 cups of chicken broth and let it boil. 8. 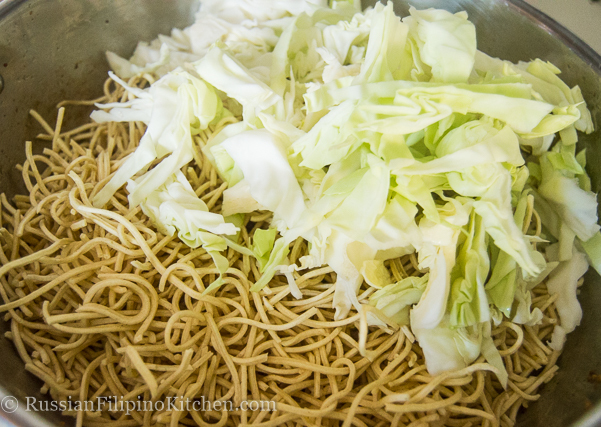 Add dry pancit canton noodles and cabbage. Lower heat to medium low and mix using a spaghetti spoon (much easier to maneuver than regular cooking spoon). Cook noodles and cabbage for about 2 minutes or until most of the broth is gone. 9. Add the sautéed meat and veggies into wok/skillet and mix, mix, mix until everything is thoroughly cooked and the liquid dries up. 10. Serve hot with calamansi or lemon or just as it is. Enjoy! 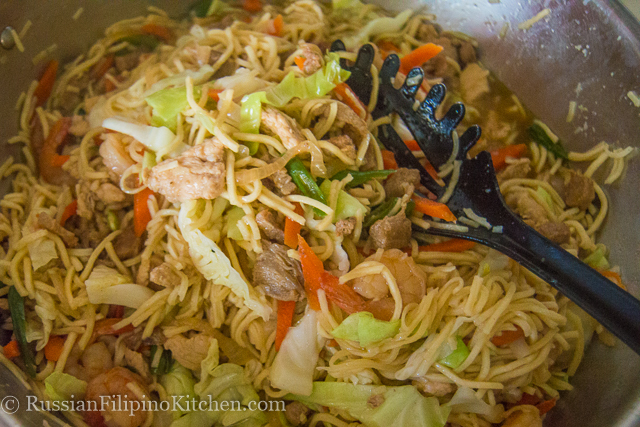 An easy pancit canton recipe with meat and vegetables. Heat wok or large skillet. 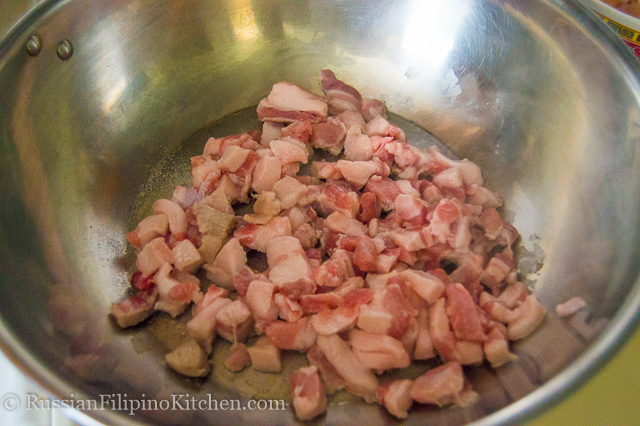 Salt pork belly with ⅛ tsp salt and let it brown. Let fat dissolve and come out. This step takes about 8-10 minutes . Discard oil leaving only 2 tbsp for sauteing. Throw in chicken breast and sauté until no longer pink, about 2 minutes. 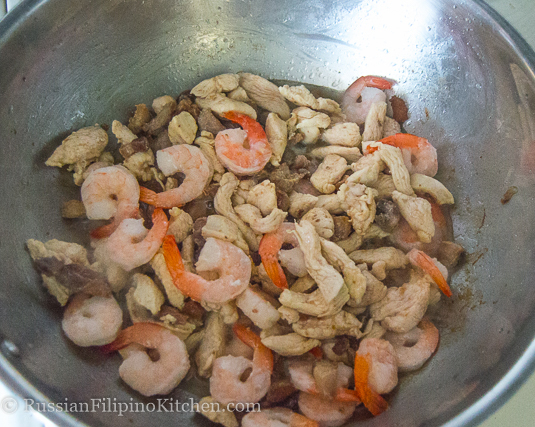 Add shrimps and cook until they turn orange, about 1 minute. Add garlic and onions and sauté until onions are translucent, about 3 minutes. Add carrots and green beans. Sauté for a minute then add the soy sauce and ground black pepper. Cook for 2 minutes till halfway done. Do not overcook. 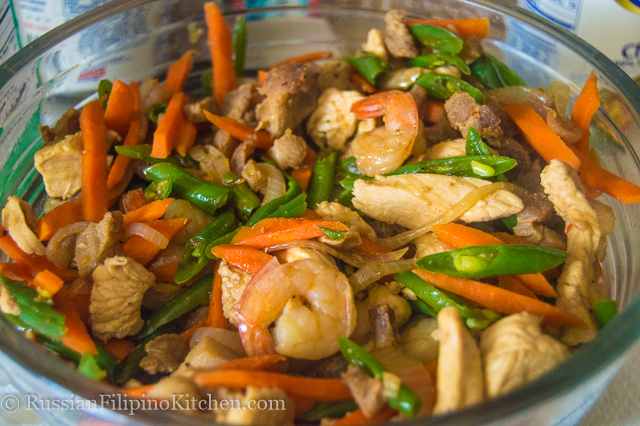 Transfer pancit base to a heat-proof container and set aside. In the same skillet where you sauté the meat and vegetables, pour 4 cups of chicken broth and let it boil. 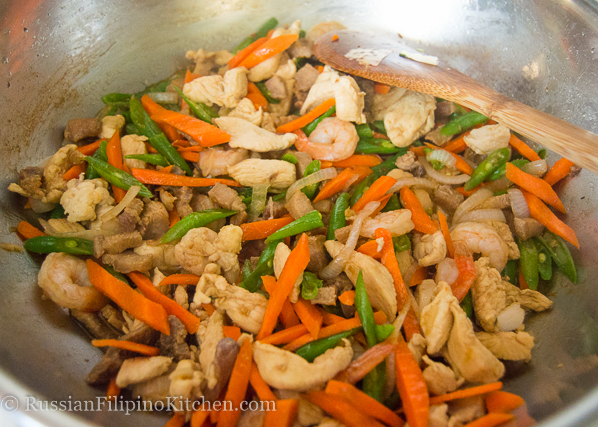 Add dry pancit canton noodles and cabbage. 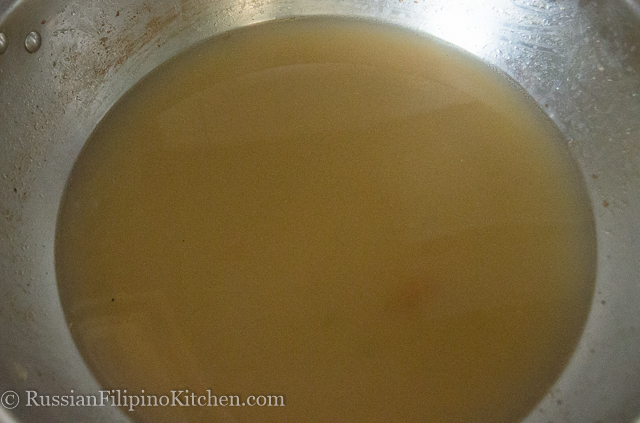 Lower heat to medium low and mix using a spaghetti spoon (much easier to maneuver than regular cooking spoon). Cook noodles and cabbage for about 2 minutes or until most of the broth is gone. Add the sautéed meat and veggies into wok/skillet and mix, mix, mix until everything is thoroughly cooked and the liquid dries up. Serve hot with calamansi or lemon or just as it is. Enjoy! Disclaimer: This post contains affiliate links to products I use and recommend. I will get a small commission from the sale to help support this site. Thank you very much! I love pancit. Everyone in my family has their own spin on it – and it’s all good. This looks delicious. Thanks! I love pancit too! LOL masarap din yan Ms. Lalaine! look pa lng masarap na…wency to….